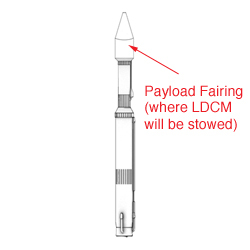 LDCM will be launched using an Atlas V 401 launch vehicle built by United Launch Alliance. Nov. 27, 2012 • At 3:27 p.m. ET, NASA Kennedy reported that the Atlas V payload fairing arrived at Vandenberg Air Force Base for Landsat Continuity Data Mission processing. They also reported that a countdown rehearsal with a fueled rocket is scheduled to take place on Tuesday, Dec. 4.